Replacing the original Fastback Waterproof Shoes, the new Alpinestars Fastback v2 Drystar Shoes arrive for the Fall of 2016 with all of the casual style of its predecessor, and with a few key differences. This updated design offers much more modern looks that would look at home on any style of motorcycle, be it a cruiser, sport bike or touring bike. The microfiber and rubber upper offers durability and style. The lace and large velcro closure system ensures comfort and safety. These shoes also feature Alpinestar's Drystar waterproof membrane to keep your feet dry on those wet rides. Also adding safety, the TPR ankle protector and lateral slider greatly reduce the chance of injury in the event of a crash. 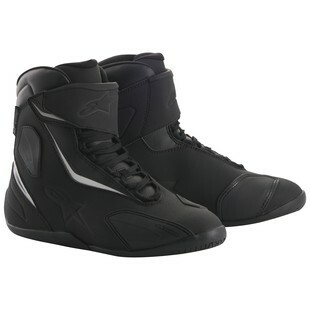 Overall, the new Alpinestars Fastback - 2 Drystar Shoes are built for riders who are looking for all-weather protection, motorcycle-specific construction, and the convenience of a pair of casual footwear that is as at home on the bike as it is walking down 5th Avenue.